St Charles Borromeo will offer its next Blood Drive on Sunday, July 23, from 8:30 a.m. to 12:30 p.m. in Reid Hall. There is a hero inside each of us, ready to make a difference when others need our help. When you donate blood you are a hero, and you can get that feeling over and over again throughout the year. Think about how the people who needed those donations feel about you. You are, without a doubt, a hero to them. 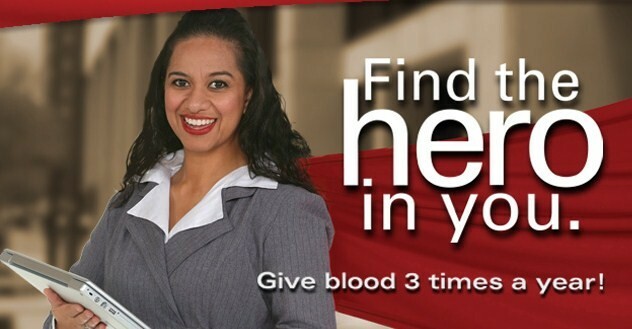 To find the hero in you, simply visit a United Blood Services donor center or blood drive in your area. Schedule an appointment online now. A Special Thank You: To Fr. Loren for his announcements and great support; To Kathy Vasseur for handling the reception/sign-in table; To our phone callers who are encouraging appointments on Blood Drive Sunday. They include: Clarence and Gloria Black; Kathy Church, Dale and Donna Darling, Tim and Silvia Mullane; Priscilla Gibson; Tim and Rose Casey. Also, thanks to Tony Valdez for public relations and sign placement. The parish has a great team making the BLOOD DRIVES successful. We have exceeded our goal for the last three drives. Please join in to help this drive be a success. Most of us know of someone who has benefitted from receiving a blood donation. Many who serve our community and nation need blood. This is a way to help. Donate and/or encourage others to donate. All donors automatically are given “rewards points” which can be used to get items, including T-shirts, DVDs, CDs, movie tickets, ice cream. See John Auckland for more information.